Already by the vertical order of the vertical blinds every window, and thus every room, appears higher than it is, airier and clearer in its structure. This potential of vertical blinds concerning design becomes even more evident if blinds of different colors are combined or the fronts of the vertical blinds are decorated with individual designs. The special characteristic and big benefit of vertical blinds, however, lies in its capability to direct light into different directions and dose it at the same time. Even the slightest turn can brighten or darken the mood within a room or cover particular areas in shadow and others in sunlight. A desirable side-effect is the feature that the view to the outside or from the outside in can be changed as pleased. Due to their purist, function-focused appearance, vertical blinds have been the preferred sun protection for functional buildings such as offices for a long time. Thus people were able to realize in which room of a building offices were located, or surgeries, law firms or beauty salons even from a far distance without having to look at the door signs. Mainly colored in white, grey or beige, they represented the clear and serious atmosphere of bureaucracy as well as the clean and austere sterility of medical facilities. 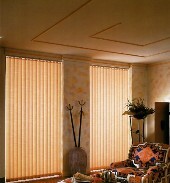 Over the years, however, these blinds which were used to restraint became increasingly colorful. Thus they did not only bring more friendliness and change to the dull everyday office life and waiting rooms but also approached homes. Here their clear structure and their unique talent in light design have been discovered and appreciated for modern living. Perfectly suitable for current trends in interior design in which clear lines are dominating and the effective use and design of sunlight plays an important role they are also able to combine individual protection requirements with creative room design like no other blind or curtain. Thus not only the functionally equipped fabrics of the vertical blinds are decorated with striking structures, colors and patterns but also natural materials such as wood, leather or paper are processed or imitated in a way that even interior styles from Asia or Africa can be realized. It is hard to believe how much science and technology stand behind the fabrics and sophisticated operating systems. But this is exactly what modern living comfort represents: Achieving highest standards concerning protection, flexibility in light design and individual style in home decoration with as little effort as possible.